Our fantastic, state of the art indoor GC2 Golf Simulator, the same equipment you may have seen on "The Golf Show" on Sky Sports, has many different uses. Here is a guide on the various uses you can make of this facility. Social play, practice, game improvement or competition. One of the greatest features on our new facility is the opportunity it will give golfers to practice or warm up.The Simulator offers a full Driving Range option where all of the Clubs in your bag can be used to work on your game or even to warm up before you head out onto the golf course. The Driving Range not only shows you where your ball has flown to (with a variety of different camera options available) but collects the data that you will generate with every shot, providing important information such as average carry and shot length, clubhead speed, spin generated and much more.This feature really is a great tool to improve your game! Of course, as well as the above usage this will be a fantastic teaching tool for our team of Professionals.The ability to hit any club in your bag, at any time of the day, during a lesson is an obvious benefit. The data which the system generates for each and every shot will allow the Professionals to provide you with outstanding feedback on your game and areas where you need to do a little work.You will even be able to see the progress you have made during a lesson before your very eyes as the ability is there for the system to leave a "tracman" type trail on the screen for every shot you hit during a lesson. The data and visual evidence produced by our new Simulator will revolutionise the way you purchase golf clubs moving forward. You will quite literally be able to see in front of their eyes which clubs suit your swing the best. We will display shot comparisons with many manufacturers for you to see on the screen in front of you. No matter how many clubs you may be trying at any one time the Simulator will differentiate between each club, and as a result it enables you to choose the best club for you. Looking for more distance? Use the Simulator to tell you which one you are hitting the furthest from an unlimited number of clubs. Want more control? 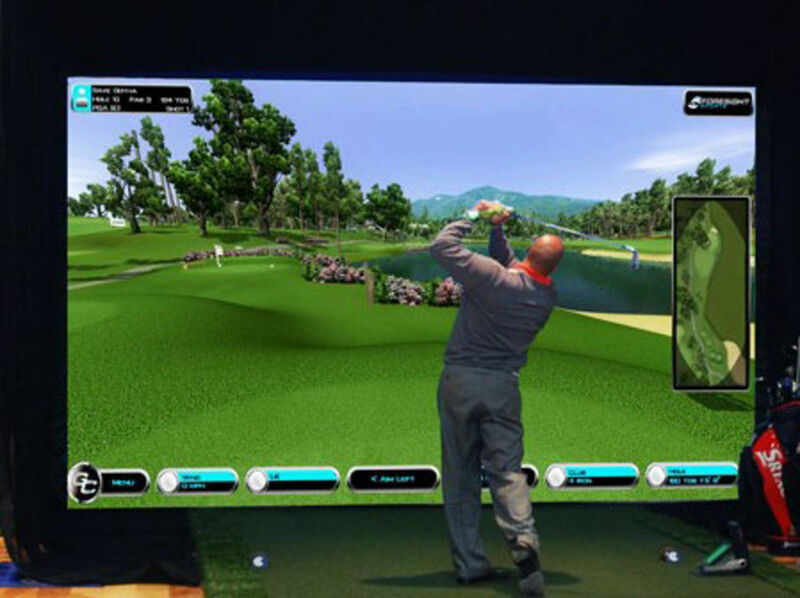 The Simulator will provide you with the information to improve your game. Do you know how far you hit each Club in your bag? Is there a gap in your distances somewhere in your set of clubs? The Simulator has the ability to provide golfers with the statistics for every club in their bag if required, enabling you to identify if there is a particular distance which you will struggle to hit a golf ball to when out on the course. Simply book in with the Professional Shop and they will conduct this test for you and give you the results. As well as offering Longest Drive and Nearest the Pin options to groups and visiting societies, The Pro Shop also run monthly Longest Drive and Nearest the Pin competitions for any Member or visitor to take part in. Each month a famous hole from those courses on offer will be selected as the hole for that month's competitions. Each entry entitles the Member or visitor concerned to three attempts and the winner at the end of each month will win the prizes on offer. Keep your eyes peeled in the Clubhouse for details of which holes will be used for Longest Drive and Nearest the Pin.